DBA were commissioned to provide the design and obtain the necessary construction consents for the Road Infrastructure required to access the Proposed 100 Acre Business Park and the First Phase of the 2000 Unit Residential Development. Following completion of their original commission, DBA were appointed as Contract Administrators with Fulltime Supervision for both projects. 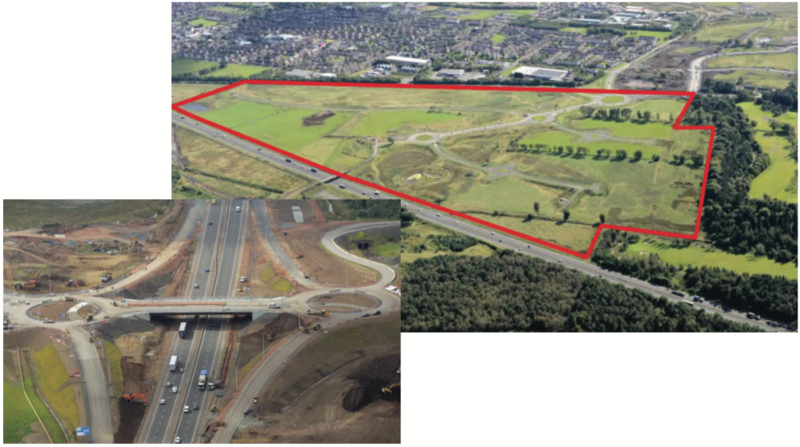 DBA were also selected to act as Contract Administrator for the Construction of the New Grade Separated Junction which links the whole development to the M8 motorway. DBA will be appointed to undertake the detailed design of the Second Phase of Residential Road Infrastructure in early 2014.
Business Park – Approx 2Km of Roads with associated drainage for adoption by Local Authority including five Roundabout Junctions and Dual Carriageway sections. Phase 1 Residential Roads – Approx 1Km of Roads with associated drainage for adoption by the Local Authority including two Signalised Junctions and Dual Carriageway sections.